The Bassett No. 2 is a continuous band adder with an exterior of sturdy woven paper or treated thin cloth. 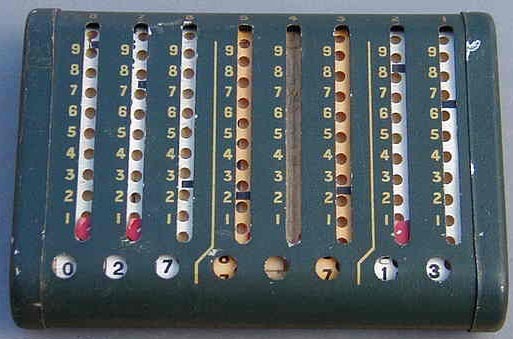 Each digit has a celluloid band punched with holes. By referring to the numbers printed to the left, one inserts a stylus into the corresponding hole and slides the band to the bottom in order to add the number. The operator must manage the carry manually, as there is no tens carry mechanism. This particular piece has been rather brutally damaged on the second band, where all holes have been ripped through. 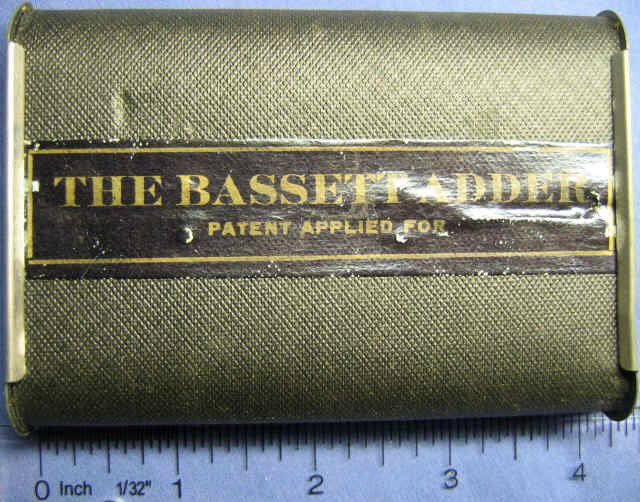 (http://www.rechnerlexikon.de/artikel/Bassett_Adder); this later model, with a tin exterior, has red carry flags at the bottom to prompt the user to perform the manual carry.